Many homes and buildings across the U.S. have crawlspaces with radon gas problems. Radon makes its way into the crawlspace from the ground underneath. Crawlspaces with exposed soil floors have no barrier to slow down or prevent radon entry. It can make its way through the floorboards into occupied areas like bedrooms, living rooms and offices. The best way to prevent radon entry in crawlspaces is to seal them and install an active-soil-depressurization system also known as a radon mitigation system. 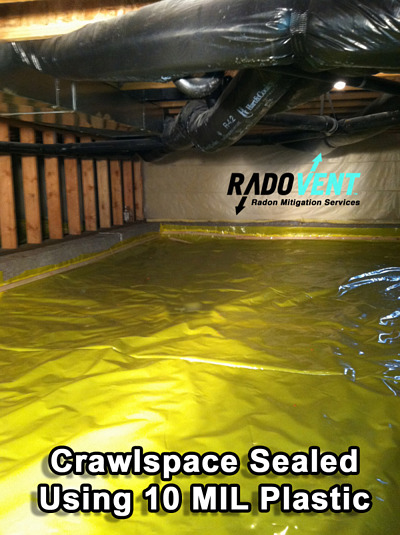 In crawlspaces that have dirt or gravel floors, we at RadoVent® seal your crawlspace with an airtight membrane called a vapor barrier. All stored items and debris must be removed from the ground prior to the installation of the crawlspace membrane. If there are sharp objects or sharp gravel we can install a layer of tar paper over the floor before placing the membrane. This helps prevent the plastic from being ripped or torn when placing storage items back in the area. We then install the vapor barrier which is a minimum 6 mil polyethylene, 6-12 mil cross laminate or 10 mil heavy duty vapor barrier. We secure the plastic membrane to the foundation walls or footings using wooden furring and concrete nails. Once the plastic is secured to the foundation walls, the entire perimeter is sealed including any seams, splices and penetrations to create an air-tight barrier to block the radon gas. The radon mitigation system is then tied directly to the soil under the membrane. The system creates a twenty-four hour vacuum that constantly pulls the radon out to vent above the roof of the house. Note: Some contractors install radon mitigation systems without sealing crawlspaces. Do not let this happen unless the crawlspace is inaccessible. A properly sealed crawlspace will further reduce radon levels, create a safer storage area and prevent energy loss. Make sure the method of securing the plastic is strong enough to last through periodic crawlspace entry such as: storing items, home repairs and utility workers. We care about the quality of your radon mitigation system and crawlspace membrane no matter who installs it. Please feel free to call us if you have any questions.